8-year-old Jalen Bailey has an entrepreneurial spirit, and high hopes for his bakery! Read the full story behind this crafty baker, and his plans! Some people are just born with an entrepreneurial spirit. Jalen Bailey is one of those people. Recently, the 8-year-old decided to use that fervent, dedicated entrepreneurial spirit to help make his mum’s life better. How exactly does he plan to pull it off? Easy. His plan is to take one of his favorite hobbies, baking, and turn a profit so he can purchase his hard working mum a new house! “I just want one that me and my mum can be happy living in,” Jalen said in an interview with TODAY. (Source: Sharhonda Mahan) Jalen and his mother, Sharhonda. Currently, Jalen and his mother, Sharhonda Mahan, live in a small apartment in Fresno, CA, USA. It’s all they can afford at the moment, but Jalen plans to improve their living situation through his effort and passion. Jalen’s no stranger to the kitchen. n fact, he started baking when he was only 5-years-old! Earlier this July, he opened Jalen’s Bakery which operates out of his apartment’s kitchen. Since opening he’s already raised over $200. Jalen operates his bakery from he and his mother’s apartment kitchen! Since opening Jaen’s Bakery, he’s mainly serviced and provided his community with quality baked goods. However, he’s created a GoFundMe page in an attempt to gain support on a nationwide (even global) scale! Learn more about Jalen’s bakery and his efforts to help his mum! Visit page 2 for more! Jalen didn’t randomly develop this entrepreneurial spirit just this year. In fact, he’s been trying to establish himself for quite sometime. At the age of 6, he started an annual back-to-school drive at a local homeless shelter and made bracelets to sell at school carnivals. He also took a business class in early June to learn how to start a lemonade stand, but decided to use those same skills to instead open a bakery. Jalen works hard to make his passion his profession! As soon as Jalen acquired his license, he attended his first business mixer. While networking and socializing with local bakers, he met one who offered to donate him an oven. From there, he could bake even more cookies, muffins and banana bread! Amazing, right? Well it doesn’t stop there. He apparently aspires to have his own baking show on network television someday! But for now, he recognizes the importance of the step-by-step process. “Once I get enough practice, maybe I’ll start making videos to post,” claims Jalen. What does mum have to say about her son’s effort? 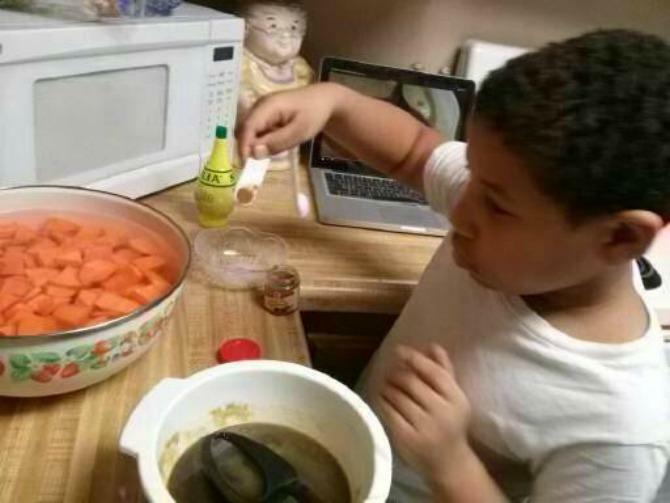 One thing’s for sure, this kid’s plan to help his mum is far from half-baked! Best of luck in your future endeavors Jalen! READ: Curiosity in children: Is it a good thing or bad thing? Here's how Urmila Matondkar met her husband Mohsin Akhtar and fell in love!